After the Norman Conquest of 1066, it became customary for the king's consort to be crowned, either alongside him or at a later date. In Anglo-Saxon England, it had not been usual for the queen to be crowned. However, William the Conqueror signalled a break with the past when he assented to the coronation of his wife, Matilda of Flanders, alongside him on Christmas Day 1066. Thereafter, the wife of the king was usually honoured with a coronation. As J. L. Laynesmith notes, the medieval coronation enhanced the quasi-religious nature of the royal dynasty and manifested a 'dynasty-bound divine right'. It conveyed divine favour while promising prosperity for the dynasty, provided that the king and his consort obey God's laws and govern their people equitably and justly. For the queen consort, the coronation was concerned with her role as an integral part of her husband's public body. Thus the coronation, as Laynesmith suggests, offered the consort 'a richer sense of her divinely ordained role'. Given that the majority of English queens in the period 1066-1558 were foreign-born, it was customary for the consort to be crowned after her arrival in England and subsequent marriage to the king. Indeed, no Englishwoman was crowned queen until Elizabeth Wydeville in 1465. The coronation, from the consort's perspective, functioned as a celebration of the ruling king's dynasty and more broadly demonstrated the wealth and magnificence of the realm which she had arrived in. However, not all consorts in the five hundred years after the Conquest were crowned, for a variety of reasons. These were complex in nature and included political troubles, financial difficulties, and domestic insurrection or rebellion that prevented the king from dedicating the time and expenses required to furnish his consort with a coronation. Whether or not a lack of coronation affected the consort's claim to legitimacy is a significant question that cannot always be answered straightforwardly, but it will be seen that at least in some cases, the consort felt slighted by the absence of this ceremony. Margaret of France was the second wife of Edward I of England (1239-1307) and married the sixty-year-old on 8 September 1299 in Canterbury. The king's first wife, the beloved Eleanor of Castile, had died in 1290. Edward was desirous of achieving peace with France, which would enable him to more effectively pursue his wars with Scotland (France's traditional ally). 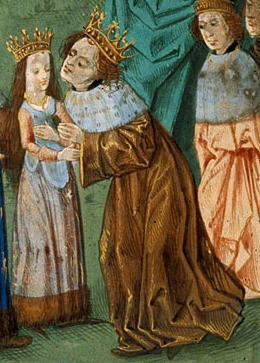 It was agreed that Edward's son and namesake would marry Isabella, daughter of Philip IV of France, while the English king himself would marry Philip's sister, Margaret. The new queen was never crowned, although she did appear on public occasions wearing a crown and used the royal title in letters and documents. Margaret was queen for a short period, but she enjoyed some success in intercession and is credited with maintaining stable relations between her husband and her stepson (the future Edward II). Margaret was also revered for her piety and favoured the Franciscan order. She also fulfilled the queen's primary duty by giving birth to two sons: Thomas of Brotherton and Edmund of Woodstock (the latter was executed during the reign of his nephew, Edward III). Margaret died in 1318, aged about thirty-nine. She was the first uncrowned consort since the Norman Conquest, and was queen for less than eight years, but she enjoyed notable successes. Traditionally, Richard II's second consort is said to have been crowned on or about 8 January 1397, but unusually, there is no extant evidence of the coronation festivities. If her coronation did take place, it must have been very low-key and this may partly be because of the hostility generated by Richard's choice of bride. The new queen was only seven years old and would be unable to bear children for some years to come. Given the uneasy political climate, it could be said that Richard had not chosen particularly wisely, although the marriage was designed to cement peaceful relations between England and France. If the coronation took place, it was apparently unworthy of being recorded for posterity; some historians doubt whether it actually took place. If it did not, Isabelle was only the second consort in over three hundred years not to be honoured with a coronation. After his failed marriages to Katherine of Aragon and Anne Boleyn, Henry VIII elected not to honour any of his subsequent four wives with a coronation. In two cases, evidence suggests that coronation festivities were planned but did not take place. Jane Seymour, his third consort, most likely would have been crowned had she lived after giving birth to her only son, the future Edward VI. Court observers reported that the king wished for Jane to be crowned in October 1536, six months after her marriage, but rumours of plague alongside insurrection in the north of England prevented the ceremony from taking place. The coronation could, and did, celebrate the queen's fertility, thus legitimising the king's dynasty. Had Jane survived the birth of Edward in October 1537, it seems reasonable to suppose that her grateful husband would have arranged for her coronation, but her unexpected death prevented this from coming to fruition. 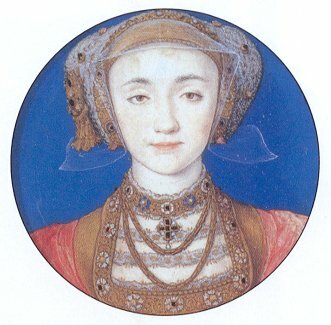 Henry's belief that Anne of Cleves was not his wife prevented her from receiving a coronation, while his final consort, Katherine Parr, was not favoured with a coronation for reasons that remain unclear. However, it is possible that Henry did consider crowning his fifth wife, Katherine Howard. The royal couple departed on a northern progress in the summer of 1541, partly because Henry was determined to ensure the north's obedience to him following recent rebellion in the area, and partly because he hoped to meet his nephew, James of Scotland, at York. One ambassador reported that Henry intended to have Katherine crowned at York, which would have marked a break with the past given that both Katherine of Aragon and Anne Boleyn, not to mention the medieval consorts, had been crowned in London. The coronation did not take place, perhaps because Henry was waiting for his consort to provide him with an heir. She did not, of course, and her execution the following year prevented her from being crowned. Whether Lady Jane Grey should in truth be referred to as Queen Jane I of England continues to be disputed by modern historians, but if she was rightful queen, as Eric Ives argues, then her husband Guildford Dudley should be viewed as her consort. Guildford, who was probably younger than his wife, most likely would have been crowned alongside his wife had Mary Tudor not successfully seized the crown from Jane and had the young couple imprisoned in the Tower of London. Contrary to popular belief, there is no evidence of animosity or dislike between Jane and Guildford and the young noblewoman continued to refer to herself as Lady Jane Dudley even while imprisoned. When Guildford requested to see Jane before their executions on 12 February 1554, Jane refused because the sight of one another would 'increase the misery in both, and bring much more suffering'. Fifteen or sixteen when he was beheaded, Guildford Dudley was the first male consort since Geoffrey of Anjou, husband of the Empress Matilda. Mary I's husband, Philip II of Spain, was never crowned. It is clear that he personally resented his wife's decision not to arrange for his coronation, because it confirmed that his wife took precedence at least in governing England. This absence of a coronation was part of a broader curtailing of Philip's powers and influence in Mary's realm. Philip was made king by an Act of Parliament stipulating that he 'shall aid her Highness... in the happy administration of her Grace's realms and dominions'. It is possible that the decision not to crown Philip was at least partly a result of the widespread antipathy to Mary's choice of a husband who was both Catholic and Spanish. In the period 1066-1558, the consort expected to be crowned alongside her husband (or more rarely, his wife). It was unusual for the consort not to be honoured with a coronation and usually, if the ceremony did not take place, it was due to extraordinary circumstances. These circumstances included political troubles, as in the case of Philip II; domestic insurrection and rebellion, as Jane Seymour and Guildford Dudley discovered, the latter being deposed alongside his wife; and the king's decision to wait for his consort to prove her fertility, as occurred with Henry VIII's later consorts. In the case of Margaret of France, it is unknown why her husband neglected to provide her with a coronation, although evidence suggests that she appeared wearing a crown on public occasions, a privilege denied to the other uncrowned consorts. Whether the consort accepted the absence of a crowning or not depended on their personality. No evidence survives for how Henry's later consorts felt, or perhaps Isabelle of France. Nor do we know whether Guildford Dudley minded, but given that his wife was also not crowned before she was deposed, it is unlikely that he had much say in the matter. But evidence suggests that Philip resented what he perceived as the curtailing of his rights in England; the absence of a coronation confirmed his supplication to Mary, at least in her own realm.